Microsoft's "Bing It On" marketing campaign is brilliantly conceived, but don't believe the results. The search comparisons leave out the most important piece of information: Location. Another: relationship. In my blind testing Google and Microsoft searches using Bing It On, the comparison is blind at worst, near-sighted at best. Bing It On is something like the Coke-Pepsi taste tests from the 1970s. People try both without knowing which is which and say which they like better. Here they blind test Bing and Google, with results presented side-by-side, left and right. But because the tests are anonymous, identity and location are missing elements, or they are for me. Also, both services now offer social graph search, which also is missing when tabulating the comparison. But wait! What about news or image searches, which I often do? Blogs and other sources? It's this richness the comparison lacks, so the taste is bland not sweet. As such, I find the comparison to be fundamentally flawed. I start my search simply with "comic books", assuming both will bring up local stores. Neither does up high, although the one on the right offers a bunch for the Bellevue, Kirkland and Seattle, Wash. areas. Neither suits my needs. The one on the right puts Wikipedia first, fifth for the other. So there are differences. For the second of five search tests, I get more specific: "comic book stores". The one on the left provides a map with stores near "Redmond, Washington". The winner! For the third test search, I try something else: Asking a question, which lots of people do when looking for information. "How big is Aroostook? ", which refers to my home county in Northern Maine. The right one provides a direct answer set apart from search links: "6,829 sq miles (17,690 km)". There's an easy winner. Another question: "What is the best search engine?" It's clearly neither of these two. Both point to a lame about.com article followed by nine-year-old Search Engine Watch story. All this tasting makes me hungry, and lunchtime has passed by, so I search: "best burgers San Diego", which is hopeless without my location being available to either service. Both serve up a list from "sandiego10best.com" -- yeah like I really want to go there. Next "best burger" and "best hamburger" from Yelp. The one on the left delivers a list of local eateries with websites, addresses and phone numbers. While neither is great, that one stinks less so I choose it. 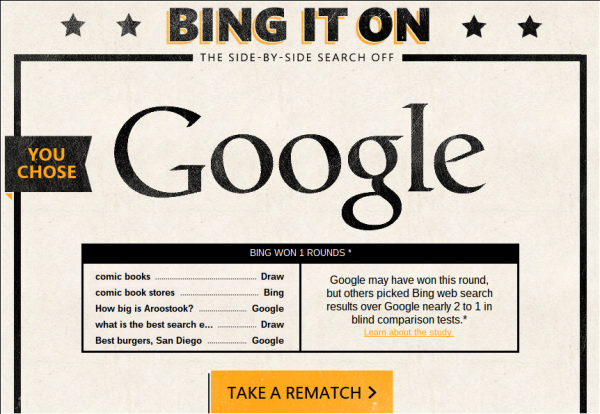 In the end Google tastes better, with two wins (Aroostook and burgers) to Bing's one (comic book stores). The other two are draws, and among the five only Aroostook satisfies. So I wonder, how do these searches look when conducted separately? I haven't used Bing for awhile. Wow, what changes. For the worse! First off, even though Bing has my location associated with my Microsoft account, searching for comic books brings up no local search information. But I am rudely and repeatedly asked to join the Microsoft Rewards program. I also receive limited social search info, by refusing to sign into Facebook. Searching for "comic book stores" brings up the same kind of map as the blind search but with shops local to me. Over at Google, searching for both terms brings up a map with comic book stores. Proving my point: Lacking location info makes the blind test blind, or near-sighted at best. Would you like to Bing It On? Click away.